The Pointe-au-Chien Indian Tribe is a small community of Indians that live along Bayou Pointe-au-Chien in South Louisiana. We created this website for tribal members in an effort to provide news and announcements and link those living outside of the community to the community via the world wide web. If you are a visitor here, welcome to our site and enjoy! On our site you will find information on Tribal Council meetings, community activities, elections, and other items of interest. HELP POINTE-AU-CHIEN REBUILD FROM THE ENVIRONMENTAL DISASTERS THAT CAUSED EXTREME FLOODING AND DESTRUCTION. 1. Donate to our building fund. 2. Help our voice to convince leaders that we need to rebuild the barrier islands, and we need a levee! 3. Help us to protect our burial grounds that are threatened from the loss of land. 4. Help us to obtain federal acknowledgment from the federal government so that we can have a real voice in responsing to emergency disasters. This is also important in maintaining our culture and livelihood. The Tribe is currently involved in many projects to increase the self-sufficiency of the Tribe: a book project, research and planning for federal recognition, and emergency planning for future natural disasters. The Tribe would like to open a community center that can be used for tribal meetings, wakes, emergency relief planning, and community events. Your support is greatly needed and appreciated. **All donations are tax deductible under the Tribe's 501(c)(3) status. 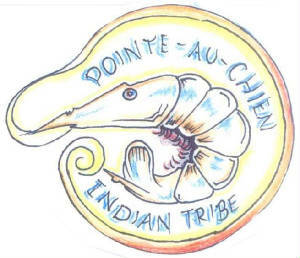 This website is dedicated to the people of the Pointe-au-Chien Indian community. We will work to address issues that concern our community and our relatives in neighboring communities, and make a difference through our website. Thank you for visiting and come back often! Please sign our guestbook so we'll know you've stopped by! JOIN IN DISCUSSIONS WITH OTHER TRIBAL MEMBERS IN OUR ONLINE FORUM, JUST CLICK ON THE BRAVENET LINK BELOW TO ENTER!